Plasmonics is entering the curriculum of many universities, either as a stand alone subject, or as part of some course or courses. Nanotechnology institutes have been, and are being, established in universities, in which plasmonics is a significant topic of research. 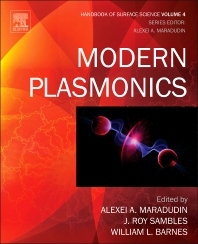 Modern Plasmonics offers a comprehensive presentation of the properties of surface plasmon polaritons, in systems of different structures and various natures, e.g. active, nonlinear, graded, theoretical/computational and experimental techniques for studying them, and their use in a variety of applications.